I was delayed. And then delayed again. And then delayed for a third time, for good measure. By the time I decided to get dinner, Chick-fil-a—the only airport option for this anti-gluten immune system (lookin’ at you, Celiac)—had closed, and a whole five minutes early, at that. I had a layover at DFW, long my layover home thanks to my frequent flights on American Airlines, and so with this who-knows-how-long delay before me, I opted for a wholesome dinner of Lays chips and one string cheese stick that cost nearly the same as an entire packet of cheese sticks from the grocery store. By the time we finally boarded, it would be 1 am before we arrived at Phoenix Sky Harbor. It was January, and I was headed west, looking forward to sunny skies and 70 degree weather. Because in Nashville, it had snowed the day before—the one and only full, postcard snowfall that we received this winter. But I had spent the snow day relatively isolated in a home where I was dog-sitting, sorting through the emotional fallout of a “that’s just not what I want” sort of conversation that had occurred in a Mexican restaurant parking lot the week prior. When I went to leave for work on that snow day, I struggled to get my car up the icy incline of the driveway, resorting to shoveling the snow and ice with a wholly-inadequate garden shovel, all while crying pitiful I’m from Louisiana and I’ve never had to shovel a driveway and CURSE YOU SNOW tears. I was a straight caricature of sadness, wallowing hard in my icy self-pity. I was spending a day in the desert alone before three of my dear friends would be joining me for a weekend of hiking and #TatTrip. As I unboarded groggily, grabbed my bag, and drove through empty streets to my Airbnb, I wondered if it had actually been a good idea for me to come here alone. I came to Phoenix two years ago and—not to add any more melodrama than necessary to this essay—I left rejected by someone I cared about. Though two years of healing and growing and living have occurred since that Sunday night redeye flight, I still wondered whether it would be possible to return to this city without feeling the ghosts of an emotional pain that, for a season of my life, had flattened me. I came carrying questions: Was it even possible to redeem this desert city? The power of hospitality is underrated, I think. When I arrived late at my casita, I walked into a room prepared so lovingly for me—notes from my Airbnb host welcoming me; oatmeal, breakfast bars, and coffee waiting bedside for breakfast—that it felt like a hug from a friend welcoming me home after a day of wearied travel. My questions of skepticism quieted as I was warmed by her hospitality. But before I went inside, I looked up: even in the light of the city, the stars were brighter here in this desert valley. Growing up in a place comprised primarily of southern pine trees and strip malls played to my advantage. I didn’t see mountains—real ones that stretched higher than 1,000 feet—until I was 19 years old. True story: I called the hills of Nashville “mountains” when I first saw them. Growing up in a place mostly void of natural beauty means I am still enthralled when I let me eyes wander over a towering mountain range or watch waves crash against boulders or see a cactus blooming pink flowers. This enthrallment reaches its peak giddy levels in the desert. The desert is a place that connects me to God in a way other places—the mountains, the sea, the rainy London streets—do not. I’ve sat in flowering mountain valleys and beside untamed seas at sunset, but there’s something ethereal, something deeper about the wild expanse of the desert, the “skies that pull you into infinity,” as author Anne Lamott describes it. They are skies that are wider than words. They are skies that pull you into God. I watched the sun arch through a blue morning sky, coffee and journal and silence in hand, the only sounds the wind winding over the ridges and the occasional hiker’s boot crunching the dirt on a nearby trail. I saw a bobcat wander casually through squat underbrush only a few feet in front of me, a bird in its mouth. I got lunch with a friend I haven’t seen in years, drinking water flavored by oranges and lemons pulled from a neighbor’s trees and having conversations flavored by fullness and laughter and God. I watched the sunset, the kind of sunset that only colors the desert: first orange, then deeper still as it sunk below the distant peaks, the sky set to fire—bright orange dancing with deep blues and pinks, the mountains surrounding cast in a pink glow. And that was only the first day. The remainder of the weekend was filled with good friends and hikes and a tattoo marking my skin with the memory of miracles and tacos that will forever shame any other taco I will ever eat. We listened to the wild dusk howls of coyotes as the sun set and the air grew cold and the crescent moon hung over the sparkling valley city. We climbed up slick rocks on a rare wet day, sitting in a cave thousands of feet up, looking out over forests of cactus as the rain fell steady, low clouds obscuring the plateau peaks. We hiked through canyons and over ridges and aside dry springs under blue skies and sunshine. “We only have to let nature speak to us about the God who is everywhere,” Henri Nouwen wrote. 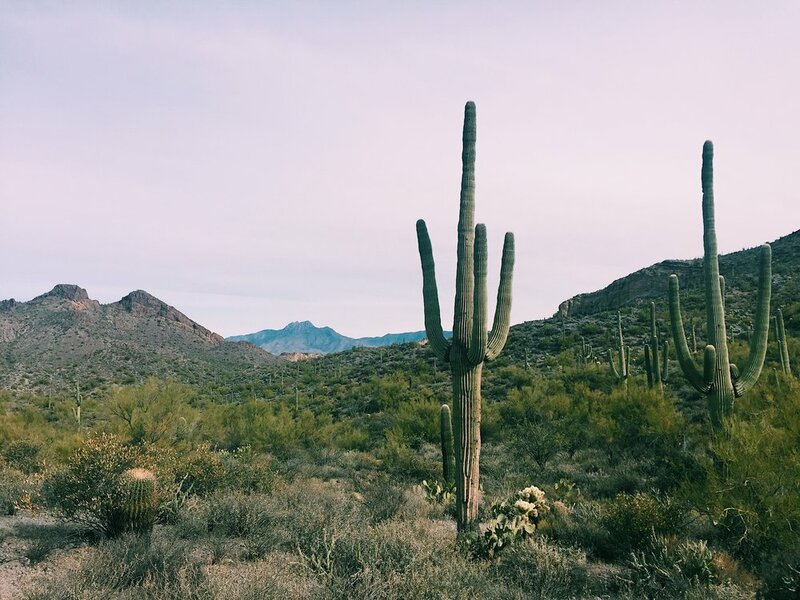 In the desert, the soul remembers how to be still; in the silent sitting on a rock surrounded by cactuses as tall as trees, the soul remembers how to rest. I could breathe out my wintertime endings and rest in warmth. In the desert, I can hope. This hope, however, is a paradox. Phoenix receives around 8 inches of rainfall per year; the average American city receives 36 inches of rain annually. Not to be outdone, The Atacama Desert in South America is the driest place on earth, receiving an average of 0.6 inches of rain per year; some areas of it can go years with no rainfall at all. This makes Phoenix’s 8 inches look like a monsoon and Nevada’s Death Valley’s 2.36 inch average look like a joke. 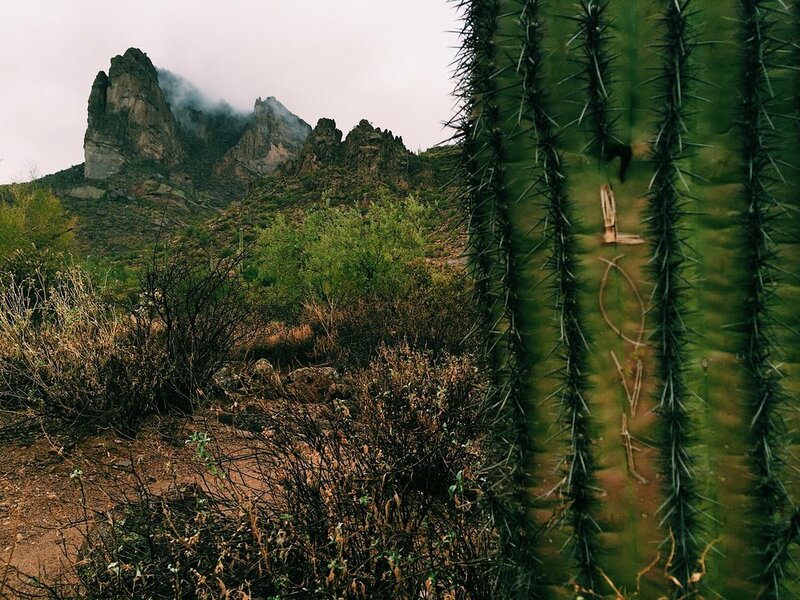 But even in a place of next-to-nothing rain, cactuses and wildflowers and trees find a home. Some cactuses can even grow up to 22 feet tall and live up to 100 years, blooming white flowers in the summer. Even in a place that would seem like the ultimate place of death, there’s life: flourishing, blooming life. I haven’t lived enough life to claim wisdom a virtue I possess, but I have lived enough to realize (slowly, and with a lot of disappointment ‘cuz let’s be real, it really ticks me off when life doesn’t go my way) that life is long story of deaths and resurrections, a cyclical rhythm reflected in all of nature: the death of winter and the life of spring, the tides pulling in and out, the darkness of night giving way to the light of day every dawn. Life isn’t a linear timeline to a destination of Ultimate Success and Happiness; I didn’t learn this until I walked through my own desert season. When I boarded that delayed flight in January, I had wondered whether I could redeem this desert city from the ending it had been the setting to years ago. Phoenix is a city bearing the very name of resurrection: up from the ashes, life. And here, in these mountains and gridded streets and under skies of infinity, I was reminded of this death and resurrection cycle that characterizes all of life. 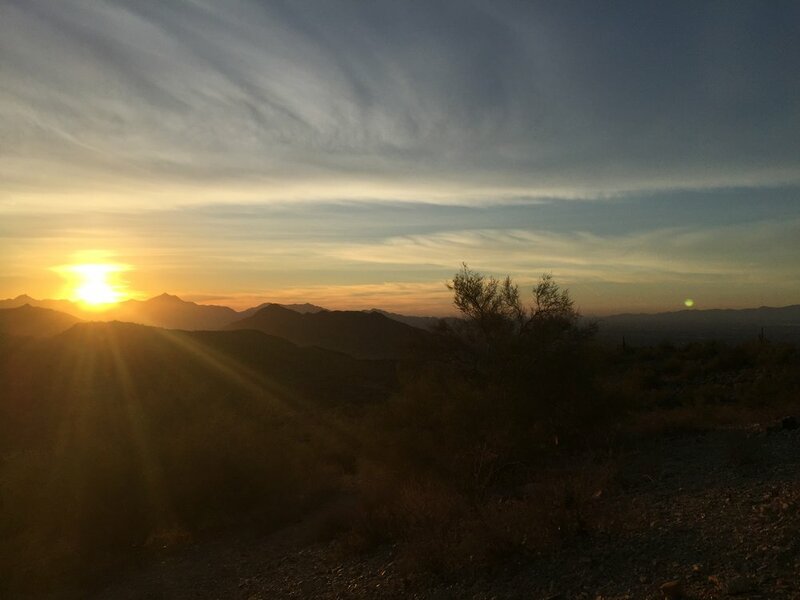 On my final night, I returned again to the summit of South Mountain to watch the sun perform its evening encore, alone as my friends and I had all gone our separate ways. “This is not the end,” Mumford & Sons sing alongside a banjo in the opening track of their first album. This is not the end, for any of us, no matter what cold circumstances we may be facing. There’s resurrection. There’s hope. Can we believe that? I basically spent the entirety of my Thursday in the sunshine on South Mountain, which is (wait for it) south of Phoenix. I began by driving up to Dobbins Lookout, where I sat with my coffee and journal, catching sight of a bobcat casually walking past me (and then promptly texting Chelsey to ask if bobcats were dangerous) and wandering down nearby trails to find other great rocks to sit on for hours. I only came down from the mountain to meet up with an old friend for lunch at her adorable home in Phoenix before returning again to South Mountain to watch the sunset go crazy over the western ranges. South Mountain is my place. IMPORTANT NOTE: The sunset photos have zero filter on them, that's how crazy wild this sunset was!!!! 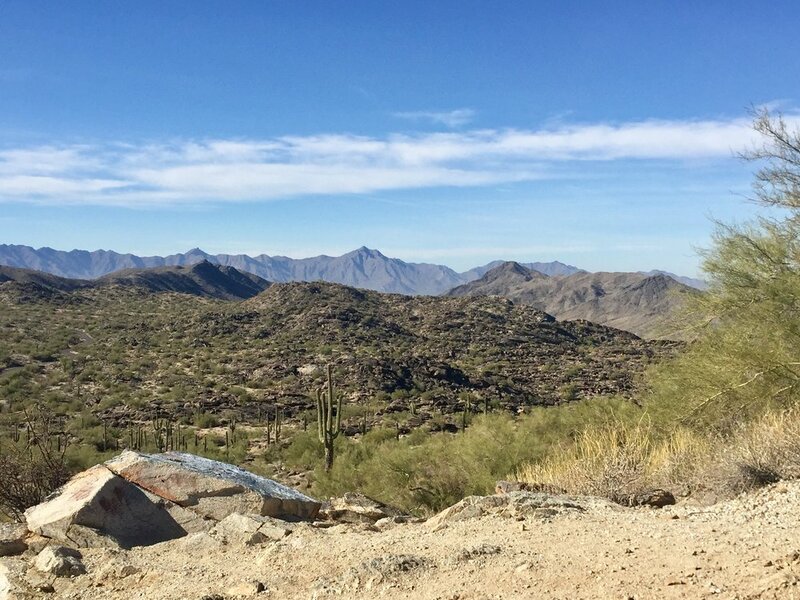 I spent another morning on South Mountain at Dobbins Lookout before heading back to Phoenix Sky Harbor for my first of many carpool rounds to pick up my friends who were coming in on Friday (we all, conveniently, came on different flights). It only took me five pickups and drop-offs before I finally realized how to get out of the labyrinth of roads around the airport without circling the terminals multiple times. Amy and I then went to King’s Coffee in Tempe where we grabbed bagels and coffee, sitting outside in the sunshine and repeatedly saying how happy we were to be away from the Nashville winter doldrums. As evening approached, I convinced Amy that her life would be infinitely worse if we did not watch the desert sunset, so (can you guess what I’m about to say?) we returned to South Mountain. We walked a nearby trail as the sun descended, briefly getting spooked by the howls of a nearby coyote pack (before Googling that no, coyotes don’t attack humans). Despite a sunset that didn’t go quite as wild on the color change as the night before, it still dazzled. By then, we were dying from hunger, so we researched nearby Thai restaurants and landed upon Yupha Thai Kitchen in Tempe. We split THE MOST DELICIOUS massaman curry and Pad Thai and I wish more than anything that I was sitting there right now eating those dishes again. Chelsey’s flight got in around 9pm, so we returned to the airport to pick her up. Then it was another few hours to wait for Mackenzie’s flight to get in a little before midnight. We had planned to grab a drink in a popular restaurant and bar strip in Tempe, but then we passed by an ice cream shop and let’s be real, ice cream > alcohol always. So we waited out Mackenzie’s flight eating ice cream and watching drunk college students from nearby ASU pass by on the sidewalk. Saturday was the one full day all four of us had together, so we capitalized on this with a day of hiking the Wave Cave Trail in the nearby Superstition Mountains range. Remarkably, this was the one day that it decided to rain, but we were undeterred. The trail itself only takes a couple of hours, as it’s 3.1 miles roundtrip up to a cave in the mountains. The hike isn’t overly difficult, but there is a bit of a climb to the cave, where you can enjoy lunch while looking out over the cactus-covered valley below. 10/10 would recommend. 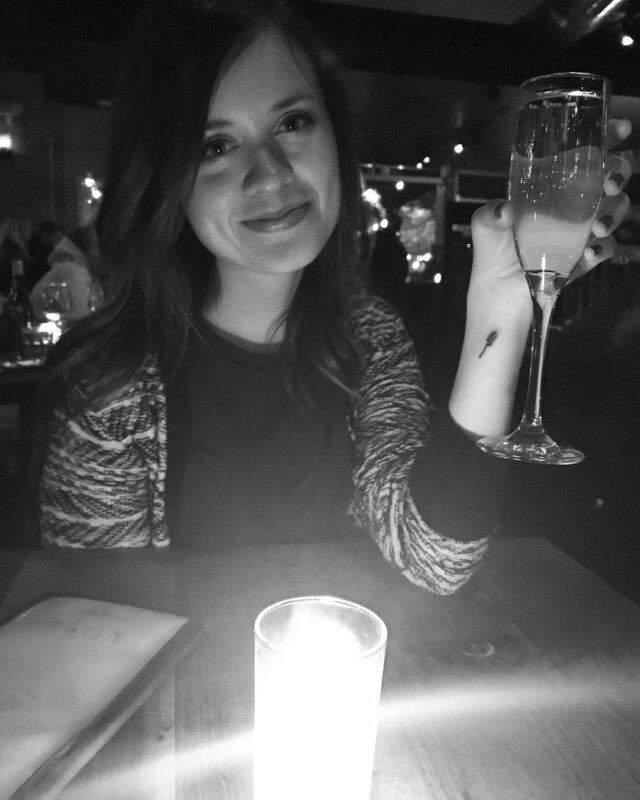 That night, we all got tatted before heading to dinner at Postino Wine Cafe in Gilbert, which offered gluten free bread—a welcome gift to my g-free self. 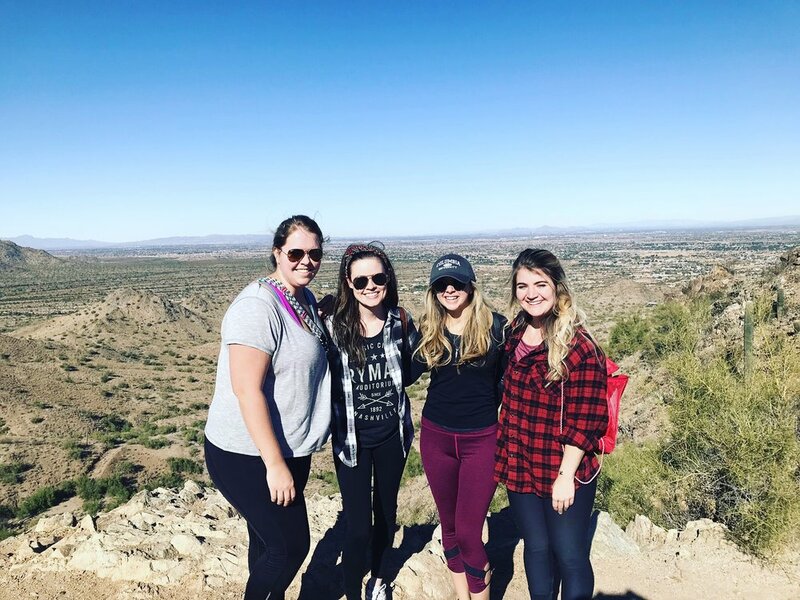 We began Sunday morning with a hike at San Tan Mountain Regional Park in the San Tan Valley where we were staying with Chelsey’s parents. We started at the Goldmine Trail that brought us up to an outlook on the mountain peak, before continuing on the Dynamite Trail, which rounded the mountain and brought us through the valley below back to our car in the parking lot. Then it was a rush to lunch before Chelsey’s flight that afternoon (which, to our fortune, ending up being delayed). 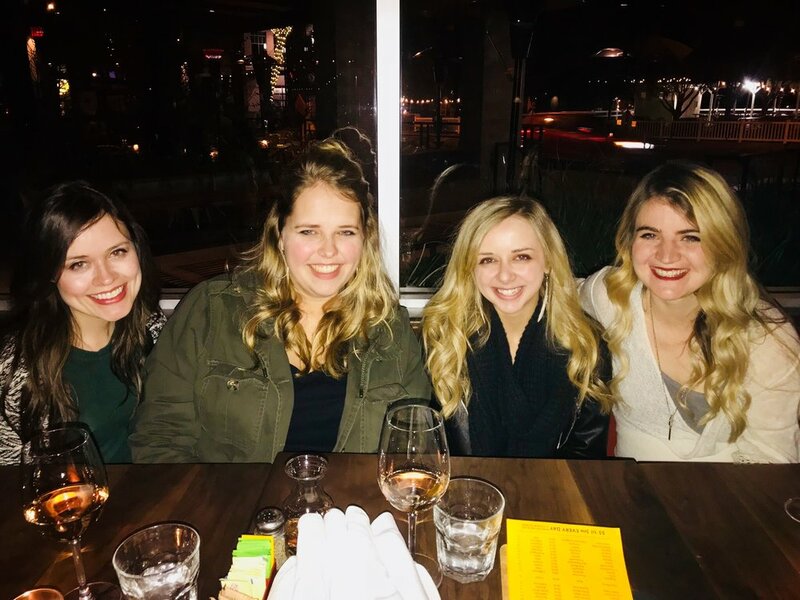 Our original intent was to hit up Joyride Tacos, but apparently everyone else in Phoenix had that same idea, so we went next door to Federal Pizza, where we enjoyed pizza (yep, g-free for me) and delicious wine coolers before dropping Chelsey off at the airport. Mackenzie went to spend time with her family, and so Amy and I explored Tempe’s shops for the afternoon, the highlight being a quaint used bookstore, Old Town Books. Monday was another sunny day (thank you, Phoenix), so Amy and I joined Mackenzie and her uncle (a straight-up desert EXPERT) for a hike in the Superstition Mountains on the First Water Trail with his adorable li’l hiking dachshunds. The trail brought us through desert brush and canyons and dry riverbeds, all the while Mackenzie’s uncle educating all of us on the magic of the desert. After our morning hike, Amy and I headed toward Gilbert to finally try Joyride Tacos, which HANDS DOWN gave me the best tacos I have ever had in my entire 25 years of living (and I’ve eaten a lot of tacos). Truly life-changing tacos. We then wandered across the street to the adorable Bergie’s Coffee before I returned to Phoenix Sky Harbor (for the sixth time in 5 days) to drop off Amy. And then I did the exact thing you should, at this point, expect me to do: I went to watch the sunset on South Mountain for my final night in Phoenix before getting some sleep at Mackenzie’s uncle’s place prior to our 5am flight back to Nashville the next morning. I'm a huge Airbnb fan and strongly recommend going this route when traveling. Haven't tried it yet? Use my referral code to get $40 off your first stay!